While the thyroid is just a small, butterfly-shaped gland no bigger than an avocado pit, it controls your metabolism, your heart beat, your energy levels, and more. The roughly 20 million women suffering from thyroid disorders can speak to its power; symptoms range from menstrual irregularity and sleep issues to anxiety and rapid weight loss or gain. Fern Langham, thyroid expert and founder of L.A.-based Thyroid Yoga, is one of them. "When I started my thyroid journey, I was eating a super-clean array of beautiful plants and was still feeling terrible throughout the day and holding on to extra weight I just couldn't lose," she writes for Mindbodygreen. "Something major was missing, and it had to do with my breakfast (or lack thereof)." 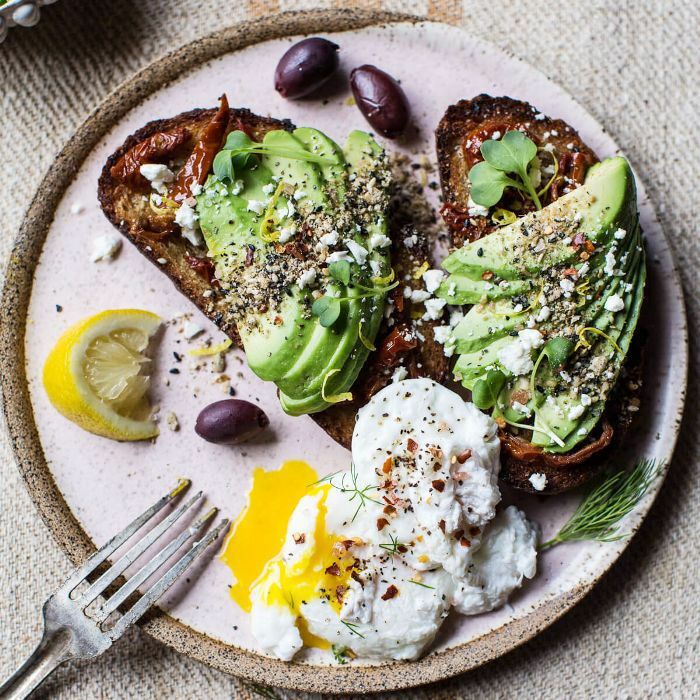 After months of trial and error, Langham discovered that eating a breakfast filled with essential proteins, herbs, nutrients, and vitamins within 90 minutes after waking up "kick-starts your thyroid, keeps energy levels up, and tunes up your metabolism." She now starts her morning with two soft-boiled eggs, half an avocado, and smoked wild salmon with greens and dulse, a red seaweed. These essential ingredients are full of the iodine, omega-3s, B vitamins, selenium, chlorophyll, and fiber necessary to promote healthy thyroid function. If belly bloat is a persistent symptom of your thyroid disorder, Langham recommends steering clear of oatmeal or toast, even if they're gluten-free. For more on thyroid function, read up on the three foods Langham won't touch.